This recipe is a combo of two dishes I’ve made in the past: Orecchiette with Chickpeas and Spinach Walnut Penne. 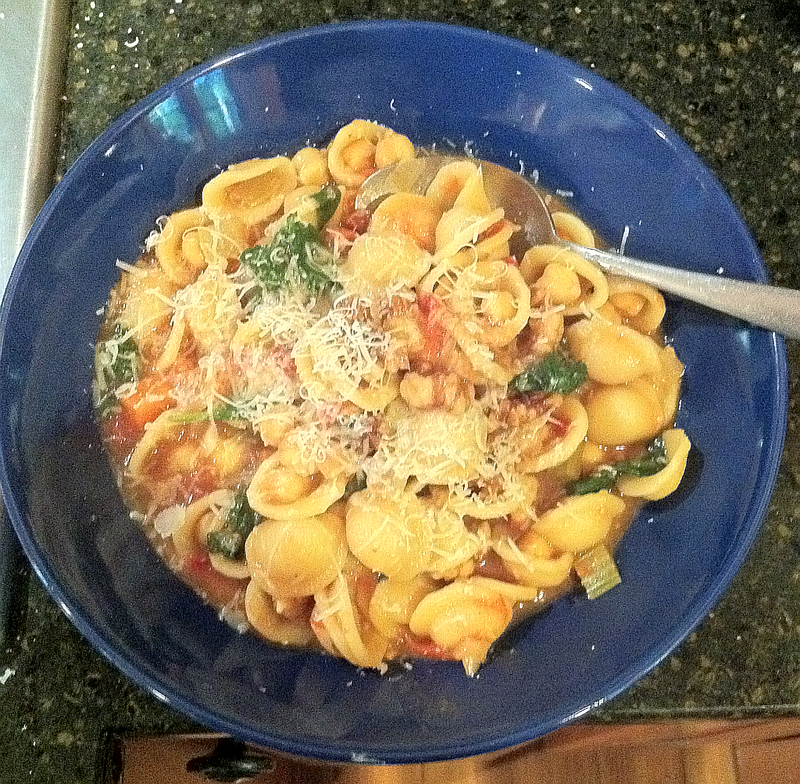 We liked the flavor profile of the orecchiette dish plus the added veg and nut of the penne. Orecchiette is a pasta that looks like a small saucer. It works well in this dish because you’ll often find a chickpea or a walnut sitting in the saucer with a bit of sauce. This recipe has you cook the pasta in what will become the sauce instead of cooking the pasta separately and adding it to the sauce later. It eliminates a dirty pot and simplifies the work. Two great tastes that taste pretty good together. We had an afternoon cookout for my sister-in-law’s birthday so we wanted a menu that we could pull together quickly when we returned home. Forgot to put this up last week and now I don’t remember a lot of the details. Here’s my best memory though. This is a good, hearty dish. We typically serve it over plain white rice. While it seems relatively good for you I’m not sure that it fits into the “eating healthier” category. The coconut milk is not the lightest product on earth. Still we enjoy it and have it once a month or so. Get your prep out of the way. Chop the onion and set aside. Mince or press the garlic and put it in a bowl with the ginger. Combine the curry powder, cumin, turmeric and cayenne in another bowl. Open the tomatoes (don’t drain them) and the coconut milk. Chop the chicken into bite size pieces. Rinse, spin and chop the spinach. Heat the oil in a medium saucepan over medium-high heat. Add the onions and cook until they begin to soften, probably 2-3 minutes. Stir occasionally. Add the garlic and ginger to the saucepan. Stir to combine and keep it moving until the garlic and ginger are fragrant. That usually takes less than a minute for me. Add the spices and combine with the onions, garlic and ginger. Keep stirring for 30 seconds or so. Add in the tomatoes, their juice and the coconut milk. Bring to a boil and reduce the heat to medium. Cook for 7-8 minutes until the tomatoes start to break down. Stir in the chicken and spinach. Reduce heat to medium-low and cover. Cook until the spinach wilts to your taste and the chicken is warmed through. Add salt & pepper to taste. Serve. This recipe is roughly based on one for Turkey and Spinach Curry found on The New York Times website. I think I was searching for uses for leftover turkey. That article was dated 2009. When Ted makes this he heats a cup or so of homemade chicken broth in a small pan to a simmer and reduces it to about a 1/4 cup. He adds that along with the tomatoes and coconut milk. It adds a bit of flavor and a certain textural component. I’m too lazy to go through that trouble (or dirty another pan).